Using a 33-mile network of planned and open multi-use trails, the Atlanta BeltLine envisions a new public realm offering a pedestrian friendly environment that promotes walking, jogging, biking, and living along the Atlanta BeltLine. The trail system currently includes five paved multi-use trails in different parts of intown Atlanta. When fully completed, the trails will follow a 22-mile corridor of old railroad segments, as well as numerous other extensions linking to many of Atlanta’s existing parks and trails with help from The PATH Foundation. A combination of multi-use trail and linear greenspace, the Eastside Trail is the first finished section of the Atlanta BeltLine trail in the old rail corridor. Funded by a combination of public and private philanthropic sources, the Eastside Trail runs from the tip of Piedmont Park to Inman Park and Old Fourth Ward. Check out the trail. 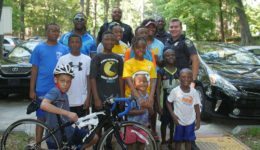 The Westside Trail is a free amenity that offers a bicycle and pedestrian-safe corridor with a 14-foot-wide multi-use trail surrounded by mature trees and grasses thanks to Trees Atlanta’s Arboretum. With 16 points of entry, 14 of which will be ADA-accessible with ramp and stair systems, the trail provides numerous access points for people of all abilities. Check out the trail. The Northside Trail through Tanyard Creek Park treats visitors to one of the most scenic stretches of the Atlanta BeltLine. The Northside Trail was the first segment of the Atlanta BeltLine trail to open on the north side of Atlanta, and it serves a connector for two previously existing trails. Check out the trail. The Southwest Connector Spur Trail is a PATH Foundation-led project that will ultimately connect to the Atlanta BeltLine through the Westview neighborhood in southwest Atlanta as part of the 33-mile network of paved trails. Check out the trail. Opened in two phases, the first in October 2008 and the second in June 2010, the West End Trail was the first section of the 33-mile Atlanta BeltLine trail system to be built. It stretches 2.4 miles from White Street to Westview Cemetery, seamlessly connecting several Southwest Atlanta neighborhoods, including historic West End, Mozely Park and Westview. Check out the trail. Unlike the five open, multi-use trails (Westside Trail, Eastside Trail, West End Trail, Northside Trail, and the Southwest Connector Spur Trail), the interim trails are more like unpolished gems. Call it the Atlanta BeltLine in its natural state. Check out the trail.